There was an element of destiny in it. We were heading out on Rte 3 for breakfast, not pie, watching the "conventioneers’ hotels and discount stores and fast-food restaurants and office complexes and Home Depot and Best Buy and Ethan Allen" roll by, when - Ding! - it's the Tick Tock, and Evy T. Chevy makes a legal-"ish" right turn (scrreeeee!) into the parking lot around noon... It's packed. We find a space, get out. Smack, smack, the doors pop shut, and seconds later we are in the vestibule checking out the gum ball and novelty machines. Sweet. They have smokin' tattoo transfers (we scored a butterfly and a hawk). Little red-headed girls were groovin' on the necklace machine. Happy diners (surprisingly healthy-looking) filing in and out. Talkin' 'bout diner paradise. Let's do it. Tick Tock Diner is a gleaming beacon of comfort on Route 3 in Clifton. We'd driven by there many tired nights after long journeys out into the Jersey hinterland and had been brightened by her shining chrome, flawless neon, and retro chic. She always beckoned, but by the time we passed the Tick Tock we were just over the hill from our favorite view of the Manhattan skyline which meant a home-cooked meal was not far away. So, we hadn't stopped in, until today. Inside, the Tick Tock has gray detailing in its curved ceiling, and classic brown Formica table tops that match the red-toned, large-speckle floors. She has capital "C" clean booths with easy-wipe seats, balanced by comfy fabric backrests. A good diner has got to be a lady, 'cause she serves up what sustains us, and at the Tick Tock that comes on custom made diner-ware tastefully decorated with the Tick Tock logo and their motto: eat heavy. Breakfast was good, and then we asked the question we know you've been waiting for: Do ya have any cherry pie? Yes! Our waitress got extra points for bringing the coffee, cream, and pie out together. Come to think of it, she's the first waitress to pull off this feat since we began our search. Kudos! Mmmmm... let's have a look at that pie. It's a healthy slice, and it's holding its form due to a fair number of cherries in the matrix. There is some flake to the crust, and whoa!, what's this? Before we can fully dissect the slice, forks are sliding in around those fulsome cherries; bites are accelerating.. Yes, this pie...it has that certain je ne sais quois; it is calling to something deeper within us, and that mysterious radar is bang on. That's a good pie. Right to the last bite something joyfully seductive had our forks jousting for the best position on the slice, and we ate every bit of the pie, crust and all. Coffee was just fine. Let's not quibble about whether the pie was properly classified as a "gourmet dessert" as their menu asserts. This pie had no refrigerator damage and artfully split the difference between a shortbread and pastry crust. 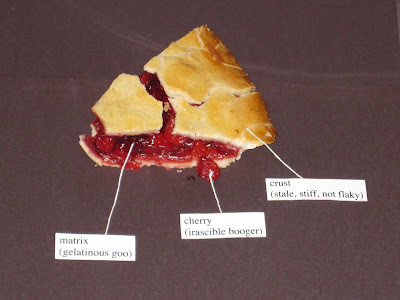 It had a thickened matrix, but not that cling, and it tasted tart but sweet, as a cherry pie should. If we could shame Jersey diners into accepting the Tick Tock pie as the acceptable standard in cherry goodness our work would be done. Hats off to you, Tick Tock! We'll be back. Cheery .. Cherry .. Pie. It's come to this. 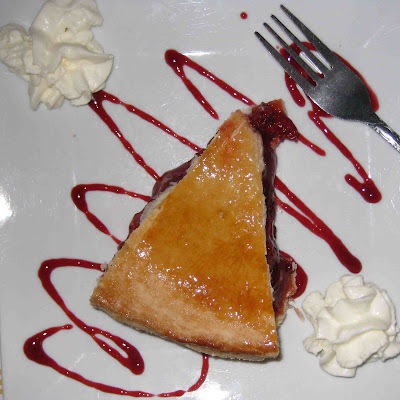 We heard about Cheery Cherry Pie in New York and wondered if it was worth checking in Hoboken. Could there be a Jersey Cheery Cherry Pie? Or is this local to NYC? Not at all. Turns out there are Cheery Cherry Pies gracing pastry cases from coast to coast at Starbucks. Yep, you heard it. And here's what Jersey Pie thinks. We think that Starbucks bigwigs are reading Jersey Pie, and, one day at high Starbucks muckety-muck headquarters, the visionaries were gathered together envisioning the next BIG THING, and, of course, at the top of everyone's list was Jersey Pie's quest for the best cherry pie, and they hotly conspired to knock this one out of the park. Then they named it Cheery Cherry Pie. Okay, so how is it? Simply put, it's a good pie. There. We admitted it. In fact, we find ourselves wanting another one as soon as possible. Did we want it to be good? Sure, well, sort of... well, maybe not. Maybe we wanted it to fit into our tirade about widget food. We have been working on a notion that attention and intention are important ingredients. In addition to its rainbow-in-the-sky moniker, a Cheery Cherry Pie has cherries, flour (wheat flour, malted barley flour, niacin, iron, thiamine mononitrate, riboflavin, folic acid), butter (cream [from milk]), sugar, palm oil shortening, water, wheat flour, starch, sugar, apple cider vinegar, whole eggs, sea salt, sodium alginate, calcium sulfate, lemon juice, egg whites. We had to get another one to help remember the experience. And we didn't regret it. Then the third Cheery Cherry Pie was just as good as the first two. They've overcome the individual pie pitfall of too much crust by folding four corners of a pastry square over the top so the crust doesn't quite go all the way around. Oh, what a clever mega-corp! Believe it or not, it is now Starbucks that is setting the bar for the best cherry pie in New Jersey. Oh, we do hate to say it. But wait! Let's return for a moment to attention and intention. Let us say that Starbucks has fed us the best TASTING cherry pie in New Jersey. And let us ask, "Is that enough?" Our conscience still has questions about the Cheery Cherry Pie. (Where is it produced? How is it distributed? What is the carbon footprint? How are the workers treated? Where do they get their cherries? How are the cherry pickers treated?) Ever since seeing Food, Inc. we have felt we cannot go in with one hand over our eyes and another hand shoveling cherry pies into our gompers. Before we bestow the blue ribbon, we want to know what our $2.09 is supporting. We want our cherry pie to be truly .. Cheery. 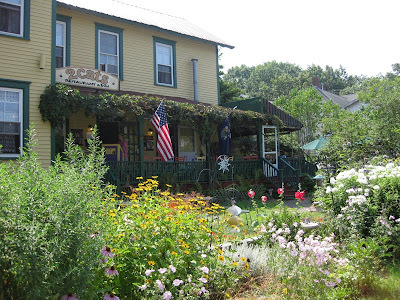 Summer at the New Jersey farm stand is shaping up to be a rewarding side trip for us diner diving folks here at Jersey Pie. We drove down from the city to a quaint little farm store named Delicious Orchards, where, we were told, real old fashioned pies were to be found. 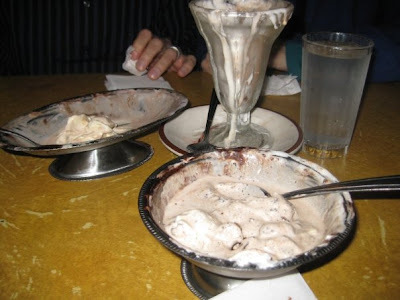 When we left we actually had an assortment of desserts in addition to a whole cherry pie, which we brought home to share with M. Slices were dealt, followed by nods, grunts and raised eyebrows. The concensus: Now we're getting somewhere! That's a good pie!! What a flaky pastry crust! What tasty, tart cherries! If we had been served this at any diner we'd have called it an unqualified success. But wait, this is supposed to be a farm fresh pie. We've sampled so many (bad ones) that we're not sure of the criteria. This pie... Well, the matrix was a little sweet for our taste. That's not necessarily a complaint, possibly just a personal preference. But we were a little suspicious. We gave Delicious Orchards a call to see if the cherry pie was high fructose corn syrup (HFCS) sweetened. It wasn't. Maybe we are getting paranoid about our food after seeing Food, Inc.. Its pretty scary. Generally we don't go for fear-mongering (unless we can get behind it, we guess), but it's worth checking out. Maybe it's not showing in your neck of the woods, so here are some of the interesting points, in case you don't get around to it. One likely ingredient in mass-produced pie filling (cherries + goo) is HFCS. That will serve as our cherry pie tie-in. We have been trying to avoid HFCS and partially hydrogenated oil. We heard HFCS is linked to the obesity epidemic, then we heard not, but hey, do we have to eat it? We don't even remember what's wrong with partially hydrogenated oil... free radicals? No, that's us... Anyhoo, we've decided against them. That pretty much rules out the cookie aisle. These days, most processed food contains HFCS. We learned from the movie this is just one of a large fistful of products made from corn, some of which have wormed their way into our cravings through processed foods. If you should pop high fructose corn syrup into a popular search engine, the first hit will be a delightful little website called Sweet Surprise. This website is the property of the Corn Refiners Association, who also funds the studies that present high fructose corn syrup in a positive light. (That last link will take you to a fun YouTube spoof of other Corn Refiners Association efforts.) Hopefully we will not be slapped with a food libel lawsuit for making fun of the Corn Refiners Association. It cost Oprah a million dollars to work her way out of one of these when she declared on television that she wanted to be sure she wasn't eating Mad Cow Diseased beef. Defenders of high fructose corn syrup are employing a curious argument. They state that HFCS is no worse than table sugar. We here at Jersey Pie would like to know, is everyone else in America like 12 years old or something? How is that an argument? Those of us who grew up in the 1960s remember Sugar Smacks (mmmm). We also remember a day when, suddenly, folks were not so keen on foods whose first ingredient was sugar. Sugar Smacks was renamed Honey Smacks in the '80s to address this consumer trend, but it still contains more than 50% sugar by weight. So, the score is Kellogg's 2, Consumers 0. We predict the next move in the hide the sugar game will be to stop listing "high fructose corn syrup" and start listing its components: glucose and sucrose. We'll be sure to alert you when we find out! Just one more corny point we'd like to make before signing off. Agent Orange producer Monsanto engineered some seeds that were resistant to their heavy duty pesticide Round Up. Engineering allows them to patent the seeds. Patented seeds allow Monsanto to sue farmers for patent infringement if pollen from their seeds spread onto crops on neighboring farms. Yup. They are really doing this. The crops Monsanto has engineered include corn, soy, sugar beets, and canola. Buying organic allows you to avoid these genetically engineered, patented foods. Just sayin'. Our Delicious Orchards cherry pie was not organic but did not have HFCS. What more could we ask? Take a look as we plate our slices while Chip and Flip sing our theme song. Turn up the sound and enjoy. For those of you just joining us here at Jersey Pie, we offer a quick review of our efforts thus far. After sampling the mediocre cherry pie offered by our local diner we decided to begin a search - chronicled in a blog - for the best cherry pie and coffee in New Jersey. Little did we know we had entered a nightmare world of refrigerator burn, coagulated goo, irascible boogers, high fructose corn syrup, and widget pies. Along the way we did get some pretty good cherry pie at the Bendix Diner (where the crust is too dense), some darn good cherry pie at the Tom Sawyer Diner (where the crust is not quite flaky), and what we think was probably very good cherry pie at the Jubilee Park Diner (where a mop bucket of bleach water overpowered our taste buds.) Six months later, we're still looking for New Jersey's best piece of cherry pie. Which brings us to the self-proclaimed #1 diner in the state. Jersey Pie experienced a vision in the parking lot of the Nutley Diner, but it wasn't a vision of pie. It looked more like a Belgian waffle with strawberries and whipped cream. Now a lunch of waffles with cherry pie for dessert is not at all sensible, we know; we struggled with the order, but the power of this vision overwhelmed the wisdom of having an omelet, so it was done. In addition we ordered a Swiss, lettuce and tomato on whole wheat toast and an order of waffle fries. Our waitress returned a few minutes after we placed our order to make sure we wanted whipped cream on the waffle. She understood the meaning of our "Yes" with psychic astuteness, for our waffle was served in a veritable helmet of whipped cream. (She knew she was good, and proclaimed it outright, in so many words.) The strawberries were abundant and absolutely fresh, and the waffle was light on the inside and toasty on the outside. If this were a waffle quest, this would be the final, triumphant post of Jersey Waffle. Our other orders were just as fresh and flavorful. The CLT sandwich and fries, for all their simplicity, could not have been better, and, yes, even the ubiquitous slaw was delicious. So we were encouraged as we sat waiting for our pie and coffee. Maybe the #1 diner in the state was going to knock this one out of the park. But there at the Nutley Diner we were faced with yet another insipid, jejune piece of...pie. A slice so pale, so wan it seemed to have been barely sustained by--weeks?--of refrigeration. And even the coffee had plenty of room for improvement. We ask you, Nutley Diner, "Why, oh why, do you not rotate the pie?" We had so much hope for you, Nutley Diner. Why disappoint us with your inferior pie and coffee? It was heartening to meet Joe Hill* (or re-meet, as we had heard the Joan Baez song), through this "pie in the sky" phrase, just after asking ourselves (see last week's post) whether industrialization had dulled our senses, dulled our expectations. We won't venture a guess as to whether workers in control of the means of production would bake a better pie. We suspect that the problem of caring, the problem of investing oneself in the task at hand, whether baking a cherry pie or doing any other task, may well remain. How do we respond? The IWW emphasized the primacy of human life and happiness, and their mission was to respond consciously to industrialization. Jersey Pie is simpatico with this. We steadfastly assert that the cherry pie product should be of the highest quality, no matter who produces it, and we will continue to alert the public to purveyors of shoddy pies. Dining establishments, if the pie is not going to be good, do us all a favor and take it off the menu. 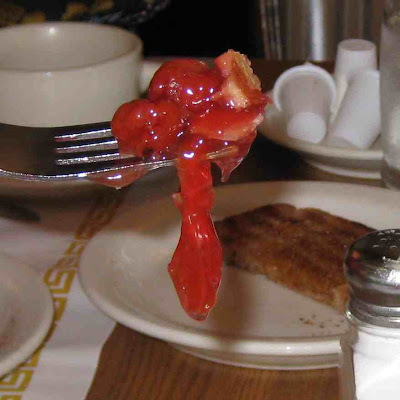 This is our answer (for now) to our readers, who must by now be asking - as we are asking ourselves - why do we keep ordering cherry pie in New Jersey diners? 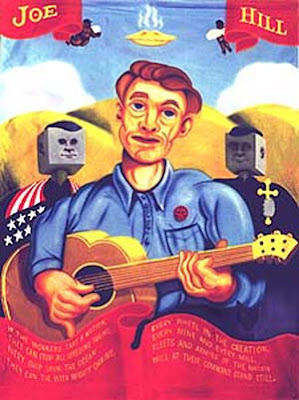 *Joe Hill, the most prolific songwriter of the Wobblies, coined the phrase "pie in the sky" in the early 1900s. Joe was stickin' it to the Salvation Army, suggesting that working folks needed pie here and now, not promises of heaven. Some folks will tell you that it was Joe's insistence on pie for the common man that got him shot full of holes by a firing squad in Utah. You see, Joe was in bed with another man's wife the night two thugs robbed and killed a merchant in the same town. When Joe turned up with a jealous man's bullet in him, the same night as the robbery took place, it looked suspicious. All the united workers of the world, and even President Wilson, couldn't save the 36 year old pie-idealist from the firing squad. His martyred body was taken to Chicago, IWW headquarters, and cremated. His ashes were mailed to IWW locals all over the world, and freed to the winds the following May 1st. Except for one envelope of ashes that was confiscated by the United States postal service and stamped "subversive." These ashes were released from the National Archive to the IWW in the 1980s, and in deference to Abbie Hoffman's prankish vision a portion of them were eaten by Billy Bragg. Jersey Pie's pie clamoring will hopefully not have such a dire outcome. Here's to you, Joe Hill. The Park Wood Diner gave us every reason to believe we would get good cherry pie. The chicken soup was good. The salad was fresh. Even the coleslaw was good. The place mats boasted "You'll like our food." A sign on the coffee maker said "God Bless America." We really believed it might happen. The slice we were served was fresh on both edges, which seemed to bode well. But that pie was nothing more than crust on the outside and red stuff on the inside. 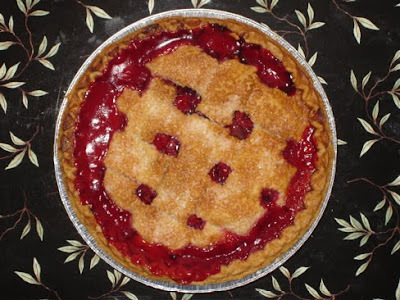 Jersey Pie: We feel that by implication they were saying that there would be cherries in the pie. Lawyer: So, are you saying it was a blueberry pie? Jersey Pie: No, we mean the quality, a thing can't have no quality at all. Could they serve anything beige on the outside and red on the inside as cherry pie? Lawyer: I think you've got no case, is what I think. Trader Joe's cherry crumb pie last weekend was not much better. All real ingredients, no preservatives, a little more than 50% crumb. Something slimy happened between the cherries and the crumbs. And sweet. Not HFCS sweet, but sugar sweet. Not good. We are starting to think we can distinguish the flavor of disregard. This Trader Joe's pie carried the taste of the bottom line. And that brings us back to the assembly line. On television this week they're advertising the new Terminator movie. And here we pose a pie-quest inspired philosophical query: Have the machines already won? Is it not so much they might gain a survival instinct and human-like consciousness as they have already dulled our own awareness...of the quality that human care brings to a pie? Rather than rising to our level, have we already fallen to theirs, with questions like: how much filler can I use and still call it pie? How little effort can I apply and still keep my job? How little can I possibly care about what I am doing and still get it done? It's a dark day for Jersey Pie. It's hard to believe we'll find any reason to carry on with our quest, and yet we continue our search. There are some lights on the horizon. We've heard of an orchard in South Jersey, where folks line up for pie. Seems positively Edenic. Is that what we're really looking for here? A sort of Platonic ideal to feed our souls as much as it stuffs our pie holes? What are we really looking for? Jackson Hole is an immaculate 50's style boxcar diner, at least in architecture. So clean you could eat off the floor, as they say. The seats sparkle like starlight. The chrome fixtures gleam. The coffee's alright. Breakfast is always on the menu. They even have jukeboxes on every table. Not open 24 hours tho. And, as the name makes clear, the emphasis is on the burgers, 7oz's cooked on the grill right before your eyes. Vegetarians beware; they'll test your moxie. Check out the Jackson Hole menu, and post a comment letting us know whether you think it's a diner menu. New Jersey Diners.com loosely defines a diner as a place that serves coffee, has a counter, is open 24 hours with their entire menu available, has a neon sign, and has jukeboxes. Jackson Hole has most of this. But it's a chain. Being a chain puts it into the Denny's/IHOP category, according to Diners.com, where it doesn't seem to belong, either. Jersey Pie doesn't mind Jackson Hole's ambiguous detailia, but lacking cherry pie, we cannot end our quest here. Practically every week we walk by a table full of "fresh pies" while marketing at our local grocery store. On many occasions we have stopped and remarked about the beautiful-looking cherry pies that are stacked there in neat rows, wondering, "Could this be one of Jersey's best pies?" But, inevitably, we walk away after reading the product information sticker. These pies have an ingredient list straight out of the chemistry lab. So were we cockeyed when we decided to pick one up and bring it home last week? Maybe. Or maybe we just decided - hey, let's give it a chance; it looks good, maybe we'll like it. So we gave it a chance. An hour or so after dinner we brewed up some decaf and cut into the pie. It performed well at first. The filling flowed when the first slice was removed, and the crust flaked. We were actually hopeful as we hoisted our forks. Wish we knew how to spell "ohhh!" the way Paulie Walnuts said it when he found out Vito Spatafore was gay. Pretty much our reaction when that pie hit our taste buds. We were expecting fruits! But what we got was a WALL of sweetness, absolutely impenetrable; we could not get past it. This immediately put our previous pie experiences into perspective. Never had we encountered a flavor so one-dimensional. And there were six cherries in a slice. Not tart, not fruity, just some sort of shriveled, pulpy things, more like ghosts of cherries. We know the ingredients a cherry pie should have: cherries, flour, sugar, shortening/butter, cornstarch/tapioca, water, salt, lemon juice, almond/vanilla extract (optional), food coloring (optional). We also understand that any baked pie will only remain fresh for so long, and that one must consider this when determining how long a pie can remain tasty. (Recently one half of JP was treated to a delicious pie purchased at a small bakery run by Mennonites in the Deep South. It maintained its taste and integrity - covered, at room temperature - for over three days.) Commercially made pies are clearly all about the science of shelf life. Not really FrankenPies, because the experimentation has all been done, these are the widget pies we have referred to before. Or, maybe the experiment is still under way, and all of us who eat widget foods are the subjects, Frankensumers. One of the curious things about a ShopRite cherry pie is that the ingredients list falls 50% under the category "MAY CONTAIN." Do you remember Mystery Meat from your school cafeteria days? This is a bit of a Mystery Dessert. A ShopRite cherry pie MAY CONTAIN: eggs, water, sucrose, corn syrup, pectin, citric acid, artificial flavor, carrageenan, sodium phosphate, sodium metabisulfate, paprika, casein, disodium phosphate, soy lecithin, spices, coloring, sugar, molasses, sorbic acid, sulfiting agents, agar. A ShopRite cherry pie contains 2% or less of: salt, dextrose, yeast, citric acid, high fructose corn syrup, potassium sorbate, soy flour, eggs, nonfat milk, sodium propionate. A ShopRite cherry pie contains 2% or more of: cherries, wheat flour, niacin, iron, thiamine mononitrate, riboflavin, folic acid, water, palm oil, soybean oil, and/or cottonseed oil, mono and diglycerides, bleached wheat flour with malted barley, corn syrup, modified corn starch, sugar. Let's be clear. New Jersey's best cherry pie does not come from ShopRite in Hoboken. Now we were expecting chemicals, because we understand shelf life theory. But, that pie lied about its sweetness, too. Its high fructose corn syrup covered up a dearth of flavor the way a heavy perfume might, or might not, hide the stench of death. It was monstrous, and we wouldn't be at all surprised if one night we and our fellow villagers form an angry mob and descend on ShopRite, armed with torches and pitchforks, demanding the monster be destroyed - or at least a better pie. 10:45 PM; Head for the car, still smelling chlorine. Is it in our hair? Unbelievable. 10:44; At register; pay $11.29 tab. Question: "What time do you usually close?" Answer: "11. 11:30"
10:43; Leave a $2 tip. 10:42; Lights go out on the grab-a-toy game in the entry. 10:41; Dude in white makes 3rd pass by our table with the mop. Exchange glances. Set down forks. 10:40:03; Dude in white makes 2nd pass by our table with the mop ......... Chewing. Breathing. Tense. Swallow. 10:40; "Jesus, he's coming again." 10:39; Eating pie now, breathing through the mouth, so you can't smell the chlorine. Can't taste the pie. "Try breathing through one nostril." 10:38:26; Dude with a mop makes first pass by our table. 10:38:19; Dude with a mop bursts out of the kitchen. 10:38:10; Odor of chlorine. Eyes lock. Oh no! Oh, yes. No way! Yes. Way. 10:38; "This crust is actually flakey. It's really pastry!" Unbelievable! 10:37:55; "The matrix isn't gelatinous!" "Look how it's flowing into the plate." 10:37:51; "No thanks; we'll do without." 10:37:50; Question: "Do you have our coffee?" Answer: "Oh, sorry about that. I can make some in about five minutes." 10:37:46; Thinking about coffee. "Mmmmm. Tasty." 10:37:43; "Look at this plump little cherry!" 10:37; Pie is set before us. Two clean forks. Beautiful. ........no coffee. 10:36: Question: "Are you ready for your pie?" Answer: "Yes! We are ready for pie!" 10:35:03; Waitress: "If I had to win that at an arcade it would have cost me a fortune." 10:35; Jersey Pie: "That's a nice elephant!" 10:34; Pushing eggs and potatoes around the plate, dreaming of pie. 10:33; Guy who was counting the money is working the claw-toy machine for the waitress. 10:27; Food arrives. Eggs look good, bodes well for the pie. 10:25; Guy at the cash register starts counting the till. 10:22:01; Question: "Do you have cherry pie?" Answer: "Yes, we do." 10:22; Order eggs and coffee. 10:19; "After all, how could a diner called 'Jubilee' not have cherry pie?" 10:18:50; Walk into the diner, look around. Rows of empty banquettes. It's dead. Silent man at cash register and lone doe-y waitress. Menus slide across the formica. 10:17; "Yes. They are open. Come on." 10:16; One goes inside. Question: "Are you open?" Answer: "Yes, we're open." 10:15; Pull into the parking lot of a dimly lit Jubilee Park Diner. The last patrons are getting into their car to leave. Question: "Do you think they're open?" Answer: "No, I don't think they're open." 10:14; Looking around; driving on the wrong side of Bloomfield Ave! "Look! There's the sign! Jubilee Diner!" 9:58-10:13; Creeping toward Clifton like it's rush hour or something. Unbelievable. 9:36-9:47; Wheeling through the night down highways and highways and highways; talking. 9:35; "I know how to get to that diner, the one we were going to go to if we went to the movie in Clifton." "Let's do it"
7:20; "Yes. I do intend to eat the pizza, eat popcorn, AND go out for pie after the movie." We have heard that too much analysis of something good robs it of its sweetness. This will be short. And we shall whisper, in case that helps. Come close. After finding the Moltisanti connection to the V.I.P. Diner, we dared to look into the location for the filming of perhaps the best five minutes in the history of television, the final scene of The Sopranos. You know, sometimes a t.v. final episode hits you like the loss of a loved one - MASH, the Carol Burnett show, Seinfeld. 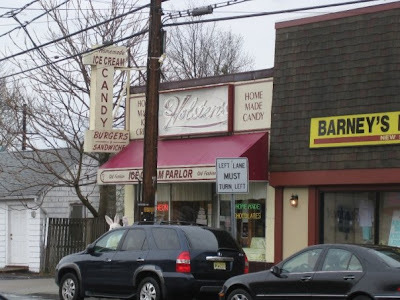 Anyway, we found the location, Holsten's, and not only was the place real (as opposed to a set) and local, but its menu listed Homemade Pies, not to mention Homemade Ice Cream and Homemade Candy. Something so special just had to be shared. We got in touch with M. on Facebook. She had just posted in her status that she was "compartmentalizing." We posted that we had something for the compartment we have come to call her pie-hole. We kept it a secret all the way to Holsten's. David Chase, who grew up in Clifton and North Caldwell, may have had fond childhood memories of Holsten's. If so, we are left all a-wonder that when he scouted the location in February of 2007 he ordered onion rings. When Tony ordered them in the final scene he called them the "best in the state." That is probably not true. The onion rings are bought frozen, not homemade like the sweet things that Holsten's serves. On that special day, everything unfolded like destiny. We picked up M. at the train station, easily found our way to Bloomfield, and (!) parallel parked right across the street from Holsten's. We were greeted at the door by the Easter Bunny. (We know, it sounds like Jersey Pie is hallucinating; that is how - hush now, whisper - special it was.) We opened the door to the smell of homemade chocolate. Very little was changed for the Soprano's shoot, and we felt like we were walking right into that transfixing Sunday evening screen. But the little jukeboxes were props, and we happen to know that the Russian-mob-looking dude went into the Ladies Room. Whether you have been hoping for it, or hoping against it, George Washington has arrived at Jersey Pie. He has arrived in an odd way: running away from Cornwallis along the part of the palisades that is now Englewood Cliffs. Historians will tell you he was running away as a stroke of strategic genius. However, Jersey Pie happens to know that in 1808, a historian of particular interest, Parson Mason L. Weems could tell a lie. To add interest to a boring childhood he invented a story of young George Washington confessing to his father that he had cut down a cherry tree, rather than tell a lie. We decided to write our own history and ride along the tops of the Palisades north of the George Washington Bridge to watch the moon rise over the Hudson from the Greenbrook Sanctuary. It was on our way home, (actually it was on our way there, but it sounds better this way) that we spied a sign: Royal Cliffs DINE RESTAURANT. More inspiration. Close inspection of the sign revealed that there had once been an "R" at the end of DINE. Could the "R" have fallen off? On both sides of the sign??? Maybe when the Englewood Cliffs part of Sylvan Avenue won the nickname "Trillion Dollar Mile" somebody thought they had better class up the joint? Is that when they found the audacity to charge $3.75 for pie? CNBC, Lipton, and Unilever are just a few of the mega-rich, well manicured corporations headquartered on Sylvan. As a result of its mega-wealthy residents, Englewood Cliffs enjoys prestigious Bergen County's lowest (lies are honest, fleeing is bridge-worthy) property taxes! Well, bully for them! Is Sylvan Avenue a "trillion dollar mile?" Or just a road through the trees above the Hudson? Now you've got us fired up, Englewood Cliffs. And your Royal Cliffs DINE(R) RESTAURANT is going to pay. Because - NO, THEY DID NOT! Well, yes, they did. They committed the most shameful, egregious pie sin in the long history (it's short, but long sounds better) of Jersey Pie. What could be so bad, you ask? What could be so bad? The Royal Cliffs pie case was right there for Jersey Pie to see. Right there before our moon dazzled eyes was the holy grail of our search: a whole pie. But wait, what have they done? No, it cannot be. Yes, they have cut into that pie, and lifted out the first piece onto a plate. They have exposed one, two, Three, FOUR! edges of virgin pie to the evils of refrigeration. Oh, unnecessarily cutting a virgin pie is bad, you say, but surely they will not serve that piece of pie?! Yes. They did. Truth. What is it? We all think we know - or guess we know. Parson Weems may have been a mystic seer warning us of our future: terrible things will be done to the truth in the guise of American goodness. Look what's been done to cherry pie for appearance sake. We guess that there are degrees of truth. You can display cherry pie on a plate in the fridge, and it may appear wonderful, but when it comes to the best cherry pie, we think freshness is essential. As soon as a pie comes out of the oven it begins to fade. To the degree that its original qualities are unimpaired it is considered fresh. 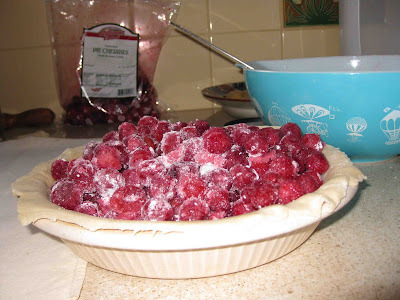 Refrigeration slows the process and creates refrigerated cherry pie. Another thing entirely. Warming is supposed to refresh it. The truth is we have to find ways to re-fresh the truth, because it's decaying all around us. We have to make adjustments. At the time of ordering, just in case this nasty slice should be forthcoming from the case, we cleverly changed our order from one slice to two, with coffee, of course. We do admit to having nearly finished that second piece of pie. There were aspects of it that whispered to us of its faded goodness. But what we wanted was that first slice of cherry pie, not the refrigerated one, the fresh one, the one they teased us with. It's out there ... good cherry pie. Don't stop believing. The Bendix Diner has the best cherry pie we have tasted so far. Sweet, tart, ruby red cherries, and a crust that settles once and for all that this dense, heavy pastry is a style, not some disregard for good taste. Now it is certain that we are not eating the same pie again and again. This pie showed handiwork: uneven fork tine impressions, and irregularities in the thickness of the crust. It almost seemed as if the rolling pin method had been eschewed for hand shaping. This crust, though there was too much of it for our taste, and too much of it to finish, tasted like good, familiar ingredients: flour, shortening, salt. A neon sign that was not fired up for our afternoon visit, declared "good coffee." We had no argument with the sign. The Bendix Diner was manufactured in 1947 by Master Diners in Pequannock, New Jersey. We are sure it has been cleaned since then, but suspect it boasts original flooring, stools, displays, and dispensers. On this wintry, inaugural Tuesday, snow is melting off the roof and dripping onto towels lining the interior windowsills. There was a friendly diner banter underway, half in English, half in Espanol, among the blue collar clientèle, and at one odd moment someone behind us started doing an impression of a pig, and an overweight man with an eczematous neck, sitting alone in a booth across the diner, began replying with his own pig impression. We don't know whether the two knew each other. Our Miss America experience taught us to call ahead for pie. The Brownstone Diner, Frozen Monkey Cafe, Carlos Bakery, Red Hawk Diner, and Tops Diner are not serving cherry pie today. (The Red Hawk Diner's recorded message announces that the only thing on the menu today is an egg salad sandwich.) The friendly woman who picked up the phone at Bendix Diner answered yes they have cherry pie in a tone that seemed to say, silly, of course we have cherry pie. We asked if it was good, again, she said yes. And Jersey Pie agrees. We admit to a fondness for diners and a presumption that they're the natural starting point for the pie and coffee experience. But we don't admit to being experts on either. We're learning as we go here. We chose the Miss America Diner for her name. The Miss America is a delightful, historical, streamline diner with dining room extensions, and rather than describe it, we refer you to the website of Alan Wolfson, a local sculptor who has immortalized the Miss America in his finely detailed replica. We took the light rail from Hoboken to the end of the West Side Avenue line and walked 2 blocks south to the Miss America, accompanied by friends from the city. The Miss America was built in the 1950s by the Jerry O'Mahony Company of Elizabeth, New Jersey. It is a proper diner in the sense that it is a mobile, prefab jobbie. And, in fact, Jerry O'Mahony, originally of Bayonne, New Jersey, is credited with inventing the diner, bringing together inspirations from the "lunch wagon" and railroad diner cars. Visit Diner News and History for more on... diner news and history. The atmosphere was warm and we were satisfied with our respectable soups, sandwiches and fries. The requisite pickle and slaw was acceptable, the slaw in humorously tiny paper condiment cups. At pie time our waitress was receptive, allowing us to ask the question that had begun to lurk back in the recesses of our pie mind. You see, it had dawned on us that in this corporate, industrial time we might always be eating the same pie. Maybe New Jersey had one pie distributer doling out widget pies to all the Jersey City diners? If this were the case would Jersey Pie die an early death? How many blog entries can be written about one pie? She answered that most Jersey diners are getting their pies from local bakeries. Hm. Something to look into. After considerable deliberation, we decided to try a slice of the apple pie and order a piece of chocolate layer cake in addition. We are glad that we tried the apple, partly because the apple pie was relatively tasty, but also because it occasioned some general pie crust conversation with our gourmand guest, the author of Urban Gastronomy. A person of very generous spirit, she drew on her experience in Illinois to offer a positive possibility for this crusty part of our pie puzzle. She reminded us that pizza lovers are sometimes put off by the crusts of Chicago pies due to regional peculiarities, and suggested that this crust could be consistent with New Jersey expectations while evading the expectations of our motley crew, with origins in the South, Pacific Northwest, and Midwest. At any rate, the "local bakeries" may be made to answer for their crust. While we can't claim that the pie tasters were really happy with the pie, the fourth of our party did seem quite happy with her cake. The coffee was good enough for diner brew, and we noted that it was offered at the most reasonable price. Where will all this lead us? Heaven knows.